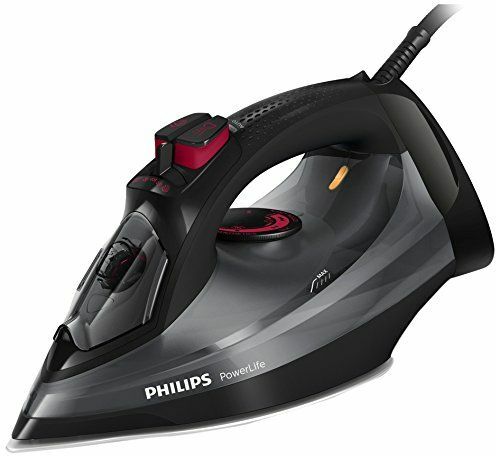 Philips PerfectCare PowerLife Steam Iron: For great results day after day, you want an iron that never lets you down. With its anti-scratch Steam Glide soleplate, consistent high steam output and integrated calc-dean, this high-quality iron give you performance that lasts. Built-in Calc-clean Slider, Long-lasting Steam Performance: This iron operates with ordinary tap water. Calc-clean is a built-in cleaning function to remove calcium build-up, or lime-scale, and maintain peak performance. Drip Stop Keeps Garments Spotless While Ironing: Our Drip Stop system lets you iron delicate fabrics at low temperatures with confidence. There's no need to worry about water droplets causing stains. Steam glide Soleplate - Superior Gliding and Scratch Resistance: Our exclusive Steam Glide soleplate moves smoothly over any fabric. A durable, 5 layer coating including anti-corrosive base makes it last longer. Non-stick, scratch-resistant and easy to keep clean. Product seems promising as advertised. As per specification - same as in sellers post. Cannot say currently - have to use and then advise.